Here’s the full story, and it’s impossible to make up a story like this. The Government Prostitutes, such as Parliamentarian Frankie Meyers are at war with the Brothel prostitutes, who are pimped out by his brother Etienne “Toachie” Meyers. 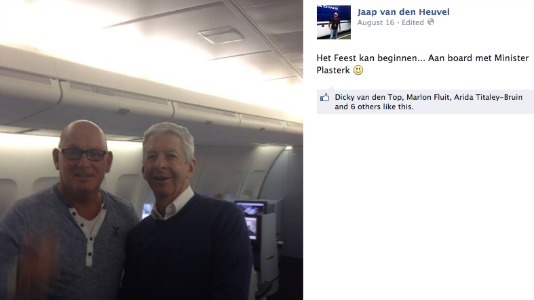 Even stranger than that, is that Theo Heyliger our former leader of governement is supposed to be “El Capitans'” part time pimp. Another note, when they were laundering the SMHDF money, did it through The Casablanca and Bada Bing brothels. In Sint Maarten government deals are made in brothels, not in Parliament. One last note, because the St Maarten government wants to monopolize the prostitution game, and Jaap Van den Heuvel is kinda in the way. As a blogger, and not a journalist, I side with those Eastern European brothel doxies, because they have more ethics, morals and integrity than the SXM Government. PHILIPSBURG–Even though talks between advisors to the cabinet of Justice Minister Edson Kirindongo and representatives of adult entertainment centres about the draft policy being devised for exotic dancers who wish to operate in the country have not yielded any results thus far, Judge Katja Mans on Monday urged parties, including the Prosecutor’s Office, to once again sit around the table to work on an interim compromise where the issuing of work permits for exotic dancers is concerned. To prevent the Government of St. Maarten from being held for an accomplice to human-smuggling it was decided to halt the issuing of work permits for exotic dancers. Since March 1 no new permits have been issued and all 63 pending requests for permits were turned down from that date.According to attorney Jairo Bloem, who is representing nine operators in St. Maarten’s adult entertainment industry, this prevents the clubs from continuing their operations. “Bada Bing will close in five days, and the other businesses are currently only half full,” he told the Court on Monday. The clubs ﬁled an injunction and an administrative procedure against Government over its move to discontinue the processing of employment and residence permits for exotic dancers, pending the ﬁnalisation of a new policy. The clubs want Government to honour the current (discontinued) policy and process the applications received for permits since December 2015, until the new policy is in place. The new policy is to be based on the new Criminal Code and international law and treaties banning human smuggling. The administrative procedure concerns the blanket turning-down of permit requests that were submitted after the discontinuation. The clubs are concerned that since the discontinuation of the processing of permits four months ago, no mechanism has been put in place for them to bring in female workers in the interim to sustain their operations while the new policy is being ironed out. The situation is stiﬂing their operations and could lead to their closure, the clubs claim. Government ceased issuing permits late last year pending a new policy to grant independent entrepreneurship licences to exotic dancers who wish to operate in St. Maarten. Government’s move is based on a court ruling in the Bada Bing case last year which stated that based on international law and under the previous policy Government could be held as a “conspirator in committing a crime” as far as human slavery is concerned. Judge Mans cautioned Government not to create a situation in which “the operation was successful, but the patient passed away.” The Judge stated that government has become entangled in a difficult “force field” made up of international relations, political standpoints, the Prosecutor’s Office’s statements, and “changing insights” about prostitution. However, prostitution is a fact of life and is not without reason called the world’s oldest profession, the judge said. “Personal protection, the protection of local girls and health concerns are playing a role. Besides, there is a world of difference between empowered prostitutes and women who were forced into prostitution. A judge does not have the answers for this,” Mans said in urging parties to sit around the table and work out a compromise. Imposing rules and regulations may be better than an outright ban on prostitution, the Judge advised. Grabbing the clubs by their throat may lead to government losing its grip on the adult entertainment business entirely, she said. Pending a new government policy, the Judge suggested the implementation of a transitional period during which the clubs would be able to remain afloat without the risk of being prosecuted for bringing in workers from abroad. Parties have until May 13 to come to an agreement. Government, however, does not seem to be very open to any compromise. “The prohibition of human trafficking is absolute. There is no room for exceptions and, therefore, also not for a transition period,” Gibson said during the hearing. Government should also not be held liable for any damages to the clubs’ business, the lawyer stated. The Court will make a decision on this matter if parties fail to reach an agreement.